Have you ever started a puzzle only to discover dozens of pieces missing? You’re struggling along, and then it suddenly makes sense why you’re just not making progress. This is what it’s like to analyze incomplete data, too. You can make assumptions and find some pieces of the picture, but you’ll never see the whole thing. At Artemis, we talk to a lot of benefit professionals who are working on incomplete puzzles. They tell us, “We have our carrier reports, so we don’t need a data partner.” In fact, in a recent survey we conducted, 24% of our respondents said they’re happy conducting complex benefits analyses in-house using carrier reports. To be honest, they shouldn’t be happy with carrier reports. They’re just one piece of the benefits puzzle. Here’s why carrier reports aren’t enough to reach real, actionable benefits insights. Data solutions are sometimes called “aggregators,” which is a good way of describing what makes them so useful. They aggregate data in one place to give users a full, holistic picture of data from multiple sources. Say a benefits team offers three different medical plans from three different carriers. If they’re relying on carrier reports, they have massive, complex data files to work from when finding trends or insights. Additionally, these reports might measure different things, employ different methodologies, and be presented in different formats. But if they’re using Artemis, they can find insights from all three carriers in one place, compare the performance of each plan, and more. 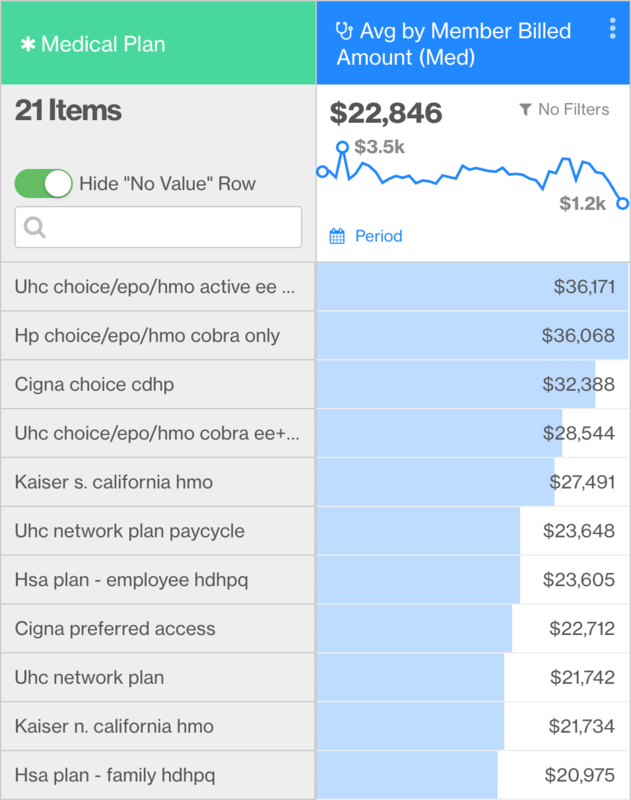 In about 45 seconds, we can see the average billed amount per member for each medical plan in the sample data. 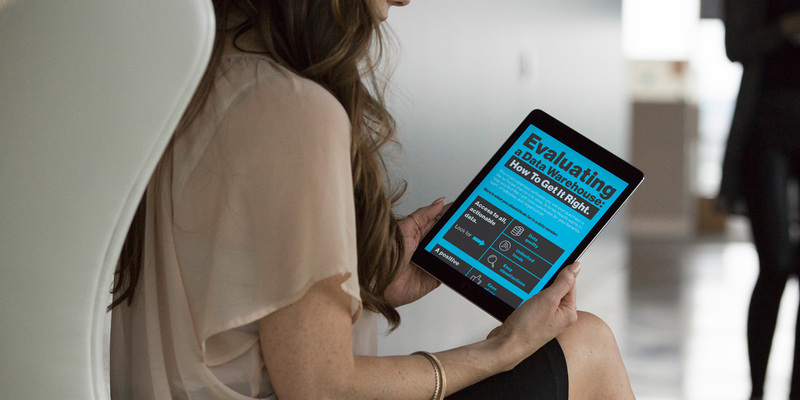 It’s simple, but it’s essential to measuring the value-based care outcomes of your carriers. This is something that would take an analyst using individual carrier reports much longer to calculate. In this sample data, we’ve compared medical, Rx, disability and ER visits for members who have and have not been diagnosed with a behavioral health condition. The data shows clearly that those with behavioral health conditions are spending more on medical and prescriptions, plus missing more work days due to disability. They’re also visiting the emergency room far more often than other members. This analysis could help a benefits team justify a behavioral health wellness program. So if you’re relying on carrier reports alone, you’re not working with the complete view you need to make connections and take action with data. One of the most limiting factors in finding insights and taking action with benefits data is the nature of the data itself. While you analysts out there are uniquely equipped to stare at rows in a spreadsheet and find a story, most of us are not able to make those leaps. Carrier reports are usually not interactive, and can be limited in what metrics they provide. You may get an Excel spreadsheet or a PDF report with the same basic info each time. It’s tough to go from thousands of rows in a spreadsheet to clear, actionable data. And you may find yourself using visualization tools that weren’t designed for use with benefits data. A data partner like Artemis can offer interactivity and tools specific to the needs of benefits professionals. 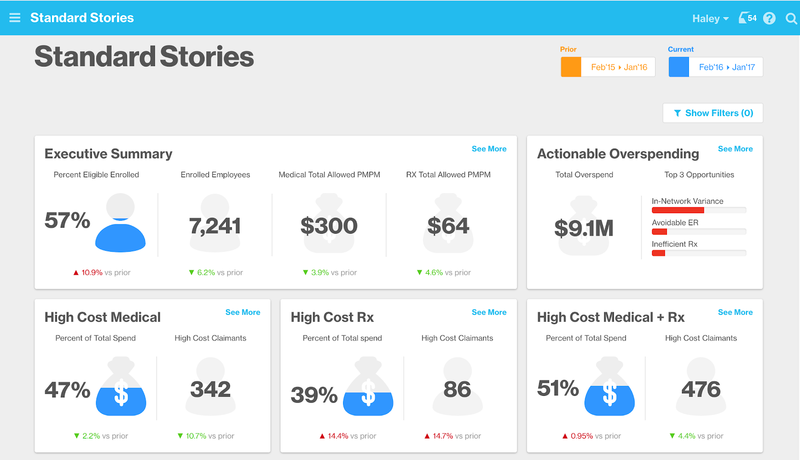 In fact, our Visualize app was built from the ground up specifically to help transform benefits data into handy charts and graphs. Data enrichment is the process of using models and benchmarks to transform raw data into a meaningful story. This is tough to do with carrier reports, and would involve an analyst creating custom data models and algorithms and applying them manually to the data. A great data partner offers data enrichment as part of their solution, and it’s built into the everyday tools users can access. Here’s a good example: the Avoidable ER functionality in the Artemis Platform. We’ve developed a unique data model to automatically group emergency department claims by those that are “avoidable”—conditions and injuries that could have been treated at urgent care or with an office visit. This data enrichment strategy pulls together data across multiple health plans and funnels certain diagnosis codes into the analysis based on industry-recognized best practices. Once a benefits professional has gathered this info, they’re in a great position to roll out member communications about common avoidable conditions and encourage use of urgent care centers or telemedicine benefits. So while carrier reports can get you a partial view at how your benefits are being used, a data solution will provide a holistic view, allow easy data manipulation, and enable valuable data enrichment. Want to learn more about how the Artemis Platform is helping benefits leaders make the most of their data? Watch a free, 2-minute demo!